Definition at line 37 of file llpanelgroupinvite.h. Definition at line 315 of file llpanelgroupinvite.cpp. References LLUICtrlFactory::buildPanel(), FALSE, LLPanel::getFactoryMap(), gUICtrlFactory, mImplementation, mPendingUpdate, mStoreSelected, and LLUUID::null. Definition at line 329 of file llpanelgroupinvite.cpp. Definition at line 350 of file llpanelgroupinvite.cpp. 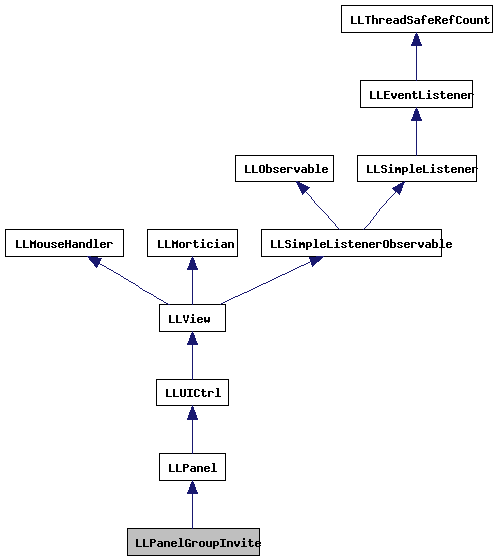 References LLPanelGroupInvite::impl::addUsers(), LLViewerObjectList::findObject(), LLViewerObject::getID(), LLViewerObject::getNVPair(), LLNameValue::getString(), gObjectList, i, LLPrimitive::isAvatar(), llendl, llwarns, mImplementation, and S32. Definition at line 341 of file llpanelgroupinvite.cpp. References LLComboBox::clear(), LLScrollListCtrl::deleteAllItems(), FALSE, mImplementation, LLPanelGroupInvite::impl::mInvitees, LLPanelGroupInvite::impl::mOKButton, LLPanelGroupInvite::impl::mRoleNames, mStoreSelected, LLUUID::null, LLComboBox::removeall(), and LLView::setEnabled(). Definition at line 385 of file llpanelgroupinvite.cpp. References LLPanel::draw(), mPendingUpdate, and updateLists(). Definition at line 473 of file llpanelgroupinvite.cpp. References LLPanelGroupInvite::impl::callbackClickAdd(), LLPanelGroupInvite::impl::callbackClickCancel(), LLPanelGroupInvite::impl::callbackClickOK(), LLPanelGroupInvite::impl::callbackClickRemove(), LLPanelGroupInvite::impl::callbackSelect(), LLPanel::childGetText(), FALSE, LLPanel::getChildByName(), LLPanelGroupInvite::impl::mGroupName, mImplementation, LLPanelGroupInvite::impl::mInvitees, LLPanelGroupInvite::impl::mLoadingText, LLPanelGroupInvite::impl::mOKButton, LLPanelGroupInvite::impl::mRemoveButton, LLPanelGroupInvite::impl::mRoleNames, LLUICtrl::setCallbackUserData(), LLButton::setClickedCallback(), LLUICtrl::setCommitCallback(), LLScrollListCtrl::setCommitOnSelectionChange(), LLView::setEnabled(), TRUE, and update(). Definition at line 334 of file llpanelgroupinvite.cpp. 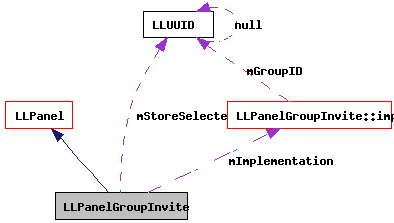 References LLPanelGroupInvite::impl::mCloseCallback, LLPanelGroupInvite::impl::mCloseCallbackUserData, and mImplementation. Definition at line 394 of file llpanelgroupinvite.cpp. References LLComboBox::add(), ADD_BOTTOM, LLComboBox::clear(), FALSE, LLComboBox::getCurrentID(), LLPanelGroupInvite::impl::mGroupName, mImplementation, LLPanelGroupInvite::impl::mLoadingText, mPendingUpdate, LLPanelGroupInvite::impl::mRoleNames, mStoreSelected, LLUUID::null, LLComboBox::removeall(), LLComboBox::setCurrentByID(), LLTextBox::setText(), and updateLists(). Referenced by postBuild(), and LLFloaterGroupInvite::showForGroup(). Definition at line 413 of file llpanelgroupinvite.cpp. References LLPanelGroupInvite::impl::addRoleNames(), LLComboBox::clear(), FALSE, LLGroupMgr::getGroupData(), LLComboBox::getItemCount(), gGroupMgr, LLGroupMgrGroupData::isGroupPropertiesDataComplete(), LLGroupMgrGroupData::isMemberDataComplete(), LLGroupMgrGroupData::isRoleDataComplete(), LLPanelGroupInvite::impl::mGroupID, LLPanelGroupInvite::impl::mGroupName, mImplementation, LLGroupMgrGroupData::mName, LLPanelGroupInvite::impl::mOKButton, mPendingUpdate, LLPanelGroupInvite::impl::mRoleNames, mStoreSelected, LLComboBox::removeall(), LLGroupMgr::sendGroupMembersRequest(), LLGroupMgr::sendGroupPropertiesRequest(), LLGroupMgr::sendGroupRoleDataRequest(), LLComboBox::setCurrentByID(), LLView::setEnabled(), LLTextBox::setText(), and TRUE. Definition at line 53 of file llpanelgroupinvite.h. Referenced by addUsers(), clear(), LLPanelGroupInvite(), postBuild(), setCloseCallback(), update(), updateLists(), and ~LLPanelGroupInvite(). Definition at line 56 of file llpanelgroupinvite.h. Referenced by draw(), LLPanelGroupInvite(), update(), and updateLists(). Definition at line 57 of file llpanelgroupinvite.h. Referenced by clear(), LLPanelGroupInvite(), update(), and updateLists().